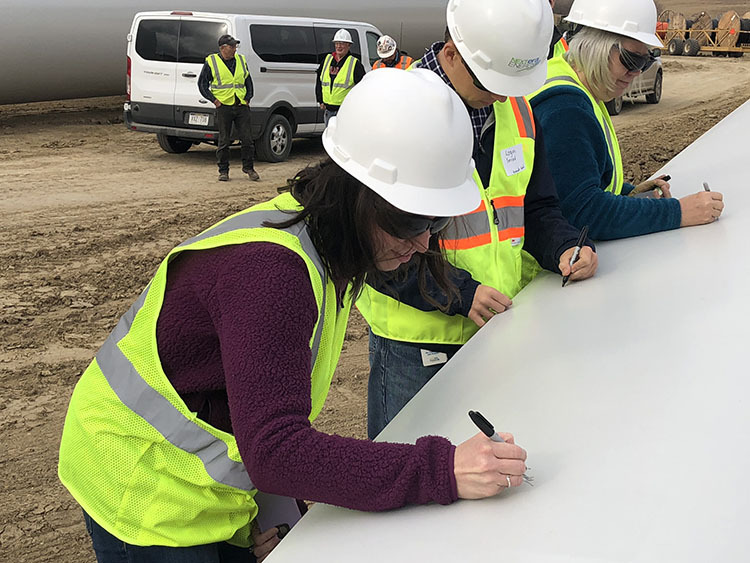 Courtney Kennedy, foreground, manager of OPPD's Alternative Energy Program, signs one of the blades for the Sholes Wind Energy Center in northeast Nebraska. 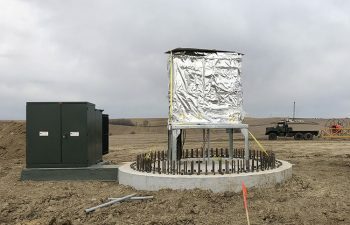 Wind turbines will soon dot the fields northwest of Wayne, Neb. The turbines, totaling 71 in all, will make up the Sholes Wind Energy Center. The facility will generate 160 MW of renewable electricity for OPPD customers beginning in 2019. OPPD has entered a 20-year partnership with NextEra Energy Resources, who will own and manage the site. On Nov. 1, representatives from the utility got a peek at the progress made since the groundbreaking ceremony in July. Turbine sites under various stages of construction now dot the hills northwest of Wayne, with one turbine already completed. Several other sites have foundations poured and tower structures and blades ready to be erected. Representatives for NextEra and site contractors said the facility is nearly halfway through the construction process. 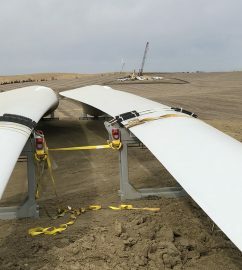 In addition to the more visible wind turbines, crews have laid miles of underground power line cables to connect the towers with the substation and collection equipment. A substation to serve the facility is under construction, targeted for completion in December. 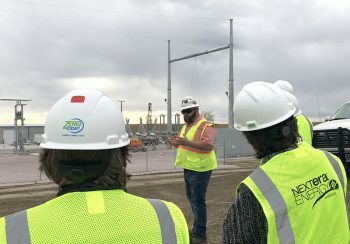 The facility allows OPPD to have nearly 40 percent of its electricity generation to come from renewable energy sources, surpassing the utility’s goal of 30 percent. Below is a photo gallery from the construction tour. 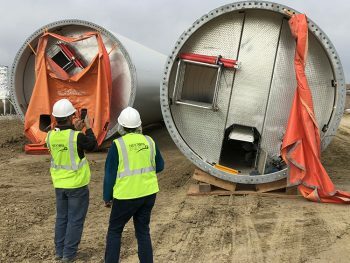 Visitors look at the bottom of the wind turbine tower, which comes in three pieces. The turbine blades stretch nearly 300 feet in length. In the distance is a site where a crane is erecting a tower. 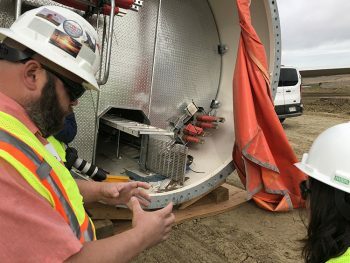 Damon Steelman explains how the tower sections connect through the red prongs pictured at the center of the frame. The electricity runs through these connectors to a transformer and substation. The base of a future wind turbine tower. The section wrapped in silver is the computer components of the structure, which is connected to the transformer on the left. Steelman describes the work occurring at the substation behind him.